Returning extinct species to life is no longer science fiction, even if the technology is not quite ready for it. For the most part, the hype on this topic was raised by the resumption of constant attempts to return woolly mammoths to the land. And not only. Not so long ago, the Harvard geneticist George Church said his team would be able to introduce a hybrid embryo in two years. The Asian elephant will be genetically created, and some features of the mammoth will be transferred to this new species. The idea to return to our planet extinct by ours and not only the fault is far from new. The first attempt to restore the lost species, wild mountain goat bucardo, was undertaken in 2003, three years after the disappearance of this species. The cloned embryo of the bucardo (Pyrenean ibex) was grown in a laboratory and then injected into the belly of a goat to take it out. He managed to survive only a few minutes because of a defect in his lungs. Attempts to revive the woolly mammoth – or his genetically modified version – were made even more often. Japanese scientists have tried to clone a woolly mammoth for more than 15 years. They still have not been able to do this. Scientists like Church believe that it is necessary to create a hybrid, not an ideal clone, using the method of editing genes called CRISPR / Cas9. CRISPR / Cas9 allows you to edit the genome of any living organism. He gained fame in 2012 and began to be advertised as a possible remedy for cancer and a number of genetic diseases, among other amazing uses. At the heart of this technique was the mechanism for protecting bacteria from viruses. In fact, the gene editing tool allows scientists to rewrite the “history” of the body’s genetic makeup. Its simplicity and accuracy in cutting and gluing the genetic material makes it extremely versatile, allowing the replacement of small DNA fragments. Since 2015, scientists under the leadership of Church made 45 “corrections” to the genome of the Asian elephant. For the most part, they were interested in the characteristics of a woolly mammoth – such as subcutaneous fat and long hair – which made them particularly well adapted to cold before they finally died out about 4000 years ago. It turned out that not every DNA of woolly mammoths would be suitable for resurrecting a species. In a study published this month in PLOS Genetics, it is said that shortly before extinction, one of the last groups of woolly mammoths survived the “genetic crisis”, as a result of which many unpleasant genetic mutations appeared in its genome. The study compared the genome of the mainland woolly mammoth, which lived 45,000 years ago when there were many animals, with the mammoth genome on an isolated island in the Arctic Ocean, where about 300 animals lived about 4,300 years ago. According to the data of the work, a small island population has lost a lot of olfactory receptors, as well as urine proteins, which can affect the social status and choice of partner. According to researchers, this work provides valuable information about what is happening genetically with the population, when it decreases. “We believe that the genomes affected by the genomic crisis will lead to long-term consequences that will impede the recovery of the population,” the researchers write. In other words, efforts to conserve small and isolated populations may be inadequate, belated due to harmful mutations. 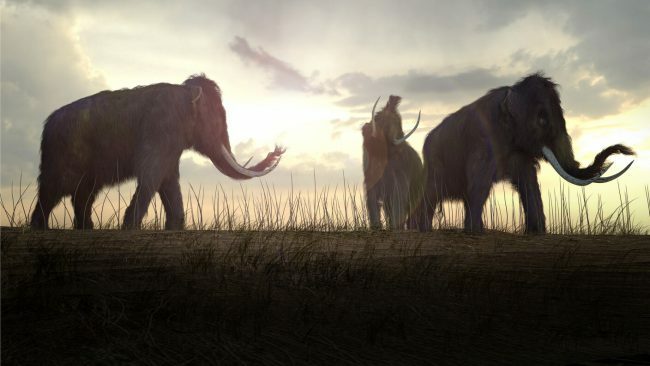 The authors also say that those interested in “resurrecting” animals should expect that the genomes of some mammoths can have negative, sometimes terrible mutations. Resuscitation efforts by Church and other scientists are based on DNA extracted from giant hair balls found frozen in Siberia. It is believed that these continental species became extinct about 10,000 years ago due to warming of climate and human activity. Bioethics can long argue on the ethical implications of resuscitation of extinct species. A new study published in Nature Ecology and Evolution may support the argument against. In their work, scientists argue that attempts to resurrect mammoths can lead to further loss of biodiversity, since the cost of resuscitation of dead species is much higher than an attempt to preserve the existing one. Scientists have calculated that for every extinct species that can be revived in New Zealand, such efforts will result in the sacrifice of the salvage of as many as three existing or living species. This ratio is even worse in New South Wales and Australia, where the resources needed for the return of the five extinct species could be used to save the 42 currently living. “Given the considerable potential of missed opportunities and the risks associated with the fact that a revived species can fill its niche in the ecosystem, it is unlikely that the resurrection procedure can be justified by the current conservation of biodiversity,” says Hugh Possingham, a professor at the University of Queensland. A woolly mammoth is not the only candidate for a return. The group, called Revise and Restore, is working on several projects to eliminate the consequences of the disappearance, as well as initiatives to save endangered species. Its flagship project is the restoration of the wandering pigeon, which died out at the beginning of the 20th century as a result of irrepressible hunting and destruction of the habitat by people. The group developed a checklist of criteria to determine whether the species would be a good candidate for return. The criteria are divided into approximately three categories: is it possible to resurrect a species scientifically? Will a revived species survive and thrive in the wild? What are the advantages of returning a species to life? In the case of the wandering pigeon, the goal is to restore regeneration cycles in the forests of East America in order to make them more diverse and productive. Forest restoration requires periodic disturbances, such as forest fires. Historically, the wandering pigeons were the main player in the riots of natural forests. “By restoring the ecological role of wandering pigeons, we can naturally restore and perpetuate the cycles of reforestation,” the group said in a statement. Among the other candidates for resurrection are bukardo, tilatsin (marsupial wolf), frog-reobarhatus, cave lion, Atlantic gray whale and, of course, woolly mammoth. It seems that there is simply no answer to the question of what species should be returned from the dead. The world is warming, habitats are disappearing, the environment is getting dirtier, and the crisis of biodiversity is deepening. The return of species to life, despite the complexity of this task, could help us restore diseased ecosystems.